Among the earliest records of human history, we find evidence of mankind’s desperate search for balance and justice, both in life and in death. For the ancient Egyptians, social order was paramount, and one’s eternal existence in the afterlife depended on living a good and moral existence in the present life. Consider the incredible example of Egyptian social order, as illustrated in a painting from the Book of the Dead of Ani, from 1275 B.C. In Hunefer’s Judgment in the Presence of Osiris, a painting from the Book of the Dead of Ani, a man called Hunefer has died. Like all Egyptians, he faces two possibilities. If he lived a good life, he will enter the afterlife. If not, his soul will be devoured by a beastlike god that is part hippopotamus, part lion, and part crocodile. In order to discern his merits, his heart is to be weighed against a feather, which is a symbol of “Ma’at,” the goddess of social order, truth, balance, and justice. If his heart is lighter than the feather, he will be permitted to enter into the afterlife. Remarkably, the painting portrays Hunefer passing this test. He is met by Horus, the son of Osiris, and he is then shown passing into the afterlife. Interestingly, however, there are several important themes in this work of art that demonstrate a uniquely modern approach, almost resembling our own democratic principles of justice. 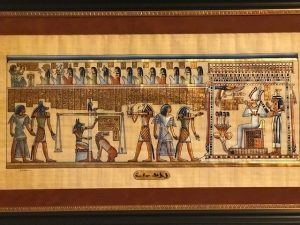 The Egyptians demonstrate through artwork that their concept of right and wrong would ultimately be determined upon death in a final judgement. A uniform and unambiguous standard would be used to judge all individuals. Each person from the richest noble to the poorest slave, would face the same test and be weighed against the same feather. Therefore, at least in theory, each Egyptian shared the same equal judgment following death. Compare this with our own 14th Amendment to the U.S. Constitution, which guarantees all citizens (living, of course) equal protection under the law. Even thousands of years later, we find that people share a desire to make sure everyone is judged by a uniform standard. Another interesting implication of the Judgment of Hunefer is that the very feather being used to ‘measure’ the life of Hunefer is a symbol for Ma’at, the goddess of morality and social order. Therefore, the Egyptians did not determine right and wrong solely by interpretation of a religious text to see if the behavior conforms. Instead, they looked at an individual’s conduct and asked whether it conformed to the social order. This slight distinction tells us that in life, just as in death, a person was judged for whether he or she maintained that order and acted within it. Again, this concept survives thousands of years and remains a fundamental bedrock of American justice – the right to plead one’s case to a jury. While we do not measure people’s literal hearts against the weight of a feather, our laws provide a framework for judging all men and women by a single standard. Unfortunately, humans are flawed. Even the best laws require hard-working and persistent advocates to preserve them. If you are charged with a crime, you may face serious penalties and maybe even years in prison. Unlike Hunefer, you should never be left to plead your case alone. Hire an experienced attorney who can fight to protect your rights. Contact attorney JohnPaul Ivec, at (815) 439-9909, to discuss your case and get the representation you deserve.